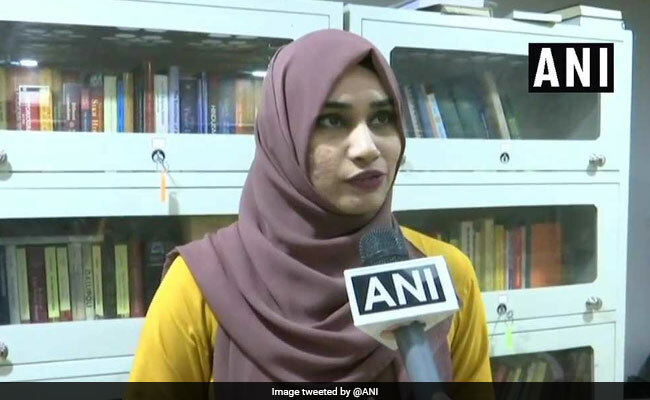 Last month, 24-year-old woman Safina Khan Soudagar alleged that when she arrived at the examination centre in Panaji on December 18, the supervisor there asked her to remove her hijab. 24-year-old woman Safina Khan Soudagar who was not allowed to sit for an exam. After woman alleged that she was not allowed to appear for the National Eligibility Test (NET) in Goa as she had refused to take off her 'hijab' (head scarf), a state government official said there are no rules specifying a dress code for the exam. Last month, 24-year-old woman Safina Khan Soudagar alleged that when she arrived at the examination centre in Panaji on December 18, the supervisor there asked her to remove her hijab. When she refused to do so, he did not allow her to sit for the test. "The woman should have been allowed to appear in the examination," Goa's higher education director Prasad Lolienkar said in a letter to the National Testing Agency of the Union Human Resource Development Ministry. "Prime facie, it appears there are no rules specified on the website (concerned) or elsewhere pertaining to exams, specially about restrictions on hijab or a particular dress code," Mr Lolienkar said. If, for any reason, hijab is not allowed, then it should be clearly mentioned in the instructions, he added. Examiners and supervisors should be sensitive towards personal liberties and religious sentiments of the candidates, he said. The official said clear instructions need to be specified on the website concerned or admit card of an exam so that candidates are well aware of the terms and conditions about the dress code, "especially keeping in mind all faiths". Ms Soudagar had approached the Goa State Human Rights Commission after not being allowed to appear for the NET. She had also sent an e-mail to Mr Lolienkar. NET is conducted by the University Grants Commission to determine eligibility for college and university level lecturership and for the award of junior research fellowship.